Tayseer Khaled, member of the Executive Committee of the Palestine Liberation Organization (PLO), warned of the reduced terms for Israeli settlers to carry weapons, which was recently approved by the Israeli Minister of Internal Security, Gilad Ardan. Khaled said, in a released statement, that there are currently about 145,000 Israel settlers in the occupied Palestinian lands with possession of permits to carry weapons, not including soldiers, police officers and others who carry firearms during work. He further explained. 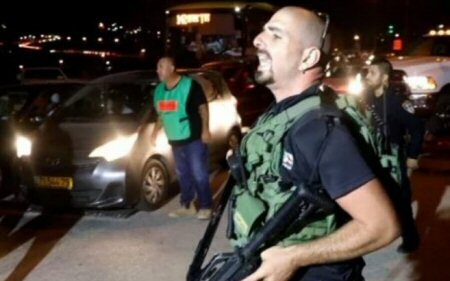 according to the PNN, that the increase of weapons license standards will increase the number of Israelis holding a license to 35,000-40,000; as a result, this will lead to an increase in the number of Israeli settlers carrying weapons in Israeli settlements and outposts to some 200,000 settlers. He stressed that these instructions, which are encouraged by the Israeli government to reduce the conditions for obtaining a firearm license under the conditions of living in a settlement close to the Apartheid Wall, mean allowing any Israeli settler who has been trained in firearms to qualify for a permit to acquire weapons, used only to kill and intimidate the Palestinian citizens. On Thursday, Israeli settlers attacked two Palestinian youth near a Nablus-area checkpoint in the northern West Bank. Israeli settlers’ attacks have recently increased, mainly in the Nablus district, during the past week.